Tower Bolt, Size: 2" To 36"
चटकनी साइज़: 2" से 36"
Looking for the absolute finest Tower Bolt for your next case piece These are beautifully crafted Tower bolt, precision milled from heavy brass stock. Tower Bolt machined from a solid extruded brass section for the strongest, most accurate and longest wearing. 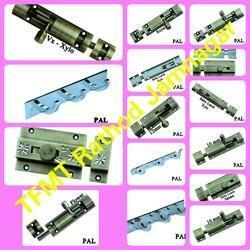 We manufacture and export Pivot Side, Pivot Center. Made from High Quality brass profile and solid casted brass and machined and fitted with accuracy for smooth and easy performance. - Extensively used in households, offices, etc.